This article is based on the experiences of a dozen plot holders on our site, including myself. I collated the information some years ago and continue to maintain and occasionally expand the articles. The names of the contributors can be found via the copyright and acknowledgements link at the end of the article. The following rudimentary observations may help you to get going. It is supplemented by the Approaches to Cultivation page which provides some idea of the various techniques that different plot holders adopt. DO be as thorough as you can when clearing a new plot. Clearing a patch that you can grow in while the surrounding area is still full of perennial weeds will only mean that your patch will get re-invaded by the bindweed, couch, et cetera with the result that you may struggle to make any real progress, often leading to you becoming disheartened. DO understand how much work it takes to cultivate a plot even after you have cleared it and got it under some sort of control. Allow a minimum of 30-45 minutes per pole per week during the main growing season (May to September). A 5 pole plot (approximately 125 square metres) will therefore require 2.5 to 4 hours per week of your time. Err on the higher side initially until you get a better feel for it. If you have other pressures on your time – be it your job, family and / or other commitments – do realise that you may probably need some help from your other half, family members or friends. DO NOT be in any great rush to sow seeds early in the year even though allotment forums seem to be full of plot holders who have started in anger and it is only January. Unfortunately most of them fail to tell you that they are probably using heated greenhouses and/or the crop will be grown in a polytunnel or other sheltered conditions. Later sowings for outdoor cultivation, from March / April onwards, will invariably catch up. DO NOT be slow to ask for advice from your neighbouring plot holders – most are only too willing to share their experiences. They should be able to tell you what succeeds and what fails in the local conditions. Also, have a look at David Frary’s web pages which are extremely useful. DO enjoy the fruits of your successes and learn from your failures … and realise that successes and failures will happen every year although they will vary depending on the weather, the soil, the varieties that you grow and the amount of TLC that you can provide. and finally, DO NOT hang onto a plot if you find that you do not have sufficient time, energy or inclination to cultivate it satisfactorily. Let somebody else have a go. There are two main factors which will drive the choice of a plot: its initial state and the amount of time that you will be able to dedicate to it once you have it ship-shape. Many allotment holders are loath to surrender their plots even though they may no longer be able to maintain them adequately. This can happen for a variety of reasons, ranging from other pressures on their time, health issues, through to waning enthusiasm. It can often take several years of near total inactivity before they are forced to accept the inevitable. It follows that available plots can often be overgrown. In 30 years I have only seen a handful of allotments that were in satisfactory condition at the time of handover. Therefore, the would-be plot holder needs to be pragmatic when deciding whether to accept or decline the allotment that is being offered; you may end up on the waiting list for a long time if you are too fussy to take on an overgrown patch. Plots that have been neglected for up to two seasons can usually be turned round in a matter of weeks; more extreme cases may take longer, and it might be sensible to overhaul the plot in stages, particularly if it is taken on during the spring (the more likely scenario). Also, consider what size plot you will be able to handle once it is in a reasonable condition given other pressures on your time. TV programmes are guilty of making it look relatively easy to maintain a plot; you do not see the army of labourers who put in the hard graft so that the “celebrities” can come along and do the artistic bits. Weeds will always grow; thinning out of crops will be necessary; the battle against pests and diseases is never-ending; watering may be essential at various times during the summer … and so on. So how much time does it take to look after a plot? Based on my own experience and feedback from other plot holders I crudely estimate that a minimum of between 30 and 45 minutes should be allowed per pole per week during the main growing season (May – Sep). This equates to 2.5 – 4 hours per week for a half-size plot (5 poles, i.e 125 square metres). I would tend to err towards the higher end initially, particularly if you are struggling to rid yourself of perennial weeds. It is of course quite easy to spend more time than this; chatting to neighbours is always calculated to increase the time required down on the plot. Less time is required during the remainder of the year. For example, it may only be necessary to put in 20-33% of the weekly growing season effort during the winter, although it is likely to be more irregular, e.g. digging may be done in longer stretches of work. In summary, do not be put off by an overgrown plot (unless you do not like hard work), but at the same time be pragmatic about the size of plot that you will ultimately be able to maintain. Some sites may allow you to take a mini plot (say 2-3 poles although sometimes even smaller) while you see what you can cope with. You can then move to a larger plot if and when you can demonstrate you ability to manage the mini-plot successfully. Finally, there are those individuals who will rotovate the plot. Although this is the fastest method it is likely to prove the least satisfactory in the long term as it will multiply the number of perennial weeds. Whichever approach is adopted, it is important that all perennial weeds are removed and disposed of. The main problems at my site are couch grass, bindweed and ground elder. Failure to remove them completely will result in them remaining a problem – they are adept at re-growing from even the smallest, unpromising piece and spreading. Rotovating ground that contains perennial weeds is asking for trouble, as you are likely to chop them up, causing them to multiply and exacerbate your problems. Gardening on an allotment differs from gardening at home. In your own (probably enclosed) garden you doubtless have the advantages of some form of micro climate or wind barriers that help germination and growth, while the scope for damage by troublesome wildlife is contained. Gardening is more challenging on an allotment as you are effectively growing in an open field where there is little or no protection. Timing of Digging. Some plot holders do not actually dig. The subject of digging (or not) is covered in the Approaches to Cultivation page. The soil on our site is basically sandy which means that digging can be done at any time from early autumn through to spring, except for the occasional spells when the ground is too wet. The risk with digging in the early autumn is that weeds will germinate and grow in any mild spells, resulting in some re-work. Some plot holders put carpet or ground cover material down after digging to avoid this problem. The other approach is to wait until early December (or later) when the weeds have stopped growing. Timing of Outdoor Sowing. There is a tendency to go by the book – if it says sow parsnips at the beginning of March then that is when we do it – because we are all keen to get on early in the season. However, the more difficult open conditions are a reason to adhere to the other piece of advice in those books, which is to wait until the soil warms up to avoid germination problems. Two, three or even four weeks delay in outdoor sowing early in the season will be quickly caught up. So, it is preferable to watch the weather trends rather than the calendar. 2013 provided a fairly obvious example. It was extremely cold during March and early season sowing / planting was inevitably delayed by a month. It was so cold that some crops did not in fact catch up and so harvesting was later than usual. Germination. There are various charts that can be found on the web which provide useful indicators of the soil temperature that is required to germinate specific vegetables. This one is particularly good, showing the likely percentage of germination at different temperatures and the number of days for germination (note that temperatures are in Fahrenheit). In addition to soil temperature open, and hence less controlled, conditions will tend to reduce the success rate of germination of seeds that are sown directly into the ground, particularly on the more exposed edges of a bed or row. This is similar to a farm field where germination and growth always appears patchier around the periphery. Apart from problems that are attributable to poor weather conditions, wildlife will tend to go for items on the edges in the first instance. Covering seed beds with horticultural fleece will provide a degree of protection. Alternatively, thicker initial sowings may be beneficial. Obviously, second sowings may be necessary to fill in any gaps. Where possible, it is frequently preferable to sow seeds at home where there is more control, particularly if you have a greenhouse, and plant them out later on the allotment. This approach can be used for brassicas, peas and beans although many plot holders simply sow them directly into the soil. It tends not to be suitable for root crops, as they normally prefer to be sown in situ, although one plot holder who likes early parsnips starts them at home in cardboard cores from used toilet rolls and simply plants out the whole thing. Half-hardy plants, e.g. tomatoes, squashes and courgettes, that cannot be put out until late May when the danger of frost has largely disappeared are usually started indoors, although some plot holders will sow courgettes, squashes and pumpkins directly into the soil around mid-May, sometimes as part of a second sowing that follows on from an earlier indoor sowing. Seedling / Small Plant Stage. In the early part of the growing season, before plant growth really takes off around mid-June, many plants are small and hence susceptible to pests. Apart from the wildlife that is mentioned on the Approaches to Cultivation page there are slugs and snails, earwigs, thrips, flea beetles, et cetera. Slugs and snails can be handled in a number of ways, slug pellets being the easiest way although some people do not like to use them. Other methods of control include the use of dried crushed egg shells and the well-known beer trap. Crawling insects can be kept in check by puffing some ant powder onto the seedlings. Aphids can appear early in a warm spring. Take the standard precautions here, i.e. spray or use companion planting – for example marigolds when planted in close proximity to beans can help to reduce black fly infestations. Alternatively, covering the seedlings / plants with horticultural fleece (or better still Enviromesh – a fine net) until they become established will help to keep pests at bay. Putting Out Half-Hardy Plants. Just as there is a tendency to sow too early so there is a similar propensity when it comes to planting out half-hardy crops. The standard rule of thumb in the UK is that overnight frosts can be expected to occur until the end of May. In 2005 we had sub-zero temperatures during the first week of June. This contrasts sharply with 2006 when the last hard frost was in April. This variability means that many plot holders are tempted to plant out tender items early, particularly if there were no frosts the previous year, some as soon as mid-April. It goes without saying that the earlier the planting the more the risk of coming unstuck. There are a couple of things that can be done to mitigate any damage: make sure that plants are properly hardened off before planting out – say 3 days left outdoors only during the daytime with a further 3 days left out at night as well (conditions permitting); cover plants with horticultural fleece on cold nights – it is effective against ground frost but not an air frost; and the use of successional sowing techniques – one plot holder makes three sowings of courgettes (early, normal and late) so that even if his early plants are wiped out by frost he has his back-ups. Although overnight frost is the number one enemy the general weather conditions can also be a problem. In 2007 April was warm and dry (more like a typical May) while May was wet and windy with a cold spell at the end of the month (more like April with a bit of March thrown in!). Battered plants started to look very unhealthy. Although many eventually recover from such conditions they are severely checked and crop yield can be affected. Alleviate wind damage where possible by making use of any natural shelter or by providing your own – one plot holder protects his tomatoes with sheets of corrugated plastic. “Walk the Crop”, as they say on The Archers. It pays to spend a few minutes on every visit during the growing season going round the plot looking for early signs of problems. It goes without saying that the earlier a problem can be identified the more successfully it can be treated. For example, it is amazing how quickly tiny “dots” on the underside of leaves can turn into full-size caterpillars that have munched their way through your brassica or gooseberry leaves – in this case, simply rub them out before they can hatch. Keep a record of the date when any problem appears for future reference. Weeds. It is not uncommon for new plot holders to put in a lot of hard work: clearing a site, digging it, sowing / planting, and then promptly turning their back on the plot for a month or more. What happens, particularly on a plot that has been uncultivated for some time, is that thousands of weed seeds germinate, grow and quickly swamp your seedlings. It can be very disheartening to see the plot look almost as bad as it was before you started within 4-6 weeks. There is no easy solution to this problem; you have to keep on top of the weeds initially. In future years the problem should lessen, but in the first year you really have to be on the ball. Do not be lulled into a false sense of security by the lack of weeds early in the season. In a normal season they will start to appear in early May … around the 10th if you want a specific date. Apart from anything else, the weeds will provide a haven for pests. If you are limited in the amount of time that you can spend at the allotment see the section below on minimising weeding for some tips on the choice of crops. Physical Protection Barriers. No apologies for repeating this – the wild life will eat some of your crops before you do unless you take measures to stop them. Brassicas, peas, mangetout, sweet corn and soft fruit are the main targets for birds and should always be netted. The Approaches to Cultivation page provides further information. Watering. When it is necessary to water, it helps if the water goes precisely where you want it to, rather than running away across the plot. For fruiting vegetables such as tomatoes that can require more water than other crops it is a good idea to sink a 4 or 5 inch pot in the ground next to the plant and water directly into the pot (inverted plastic bottles with the bottoms cut off are an alternative). This means that the water goes straight down to the roots where it is most needed. Another tip concerns the planting out of leeks. For each row, create a small channel that is circa 3 inches wide (e.g. the width of a hoe) and around 1-1½ inches deep. Plant the leeks in the middle of the channel and then water the channel. Some crops seem to get by with very little water: courgettes, marrows and the squash family are hardy in this respect once they become established, particularly if they have been planted in soil that has been enriched with organic material. Some plot holders try to avoid the need for watering by using ground cover material to minimise evaporation. untidy plots with heaps of waste strewn around, particularly plots that are seldom worked, are attractive to many animals and insects. Examples include mice, rats, voles, ant nests and wasp nests. cleaning glass, plastic, pots, canes, et cetera with a disinfectant such as Jeyes Fluid or Armatillox over the winter will help to minimise disease. Summer Holidays. Many newbies will gradually realise that some of their crops will, somewhat annoyingly, mature while they are away on holiday during July and August. This is particularly a problem to plot holders with children of school age. They often find it difficult to spend time at the allotment during the school holidays. The secret is to time your sowing / planting. The options are to sow or plant earlier (assuming that weather conditions allow this) or later than usual. The ideal approach is to do both. For example, plant 50% of your runner beans at the normal time (or perhaps a week or two earlier if you are prepared to risk frost damage) and sow the other 50% in the first or second week of June. The early planting should get you a crop just before the school holidays while the later sowing should start cropping in late August. leek moth – the maggot tunnels down a leaf towards the centre of the plant, usually a problem from July to September. There are various useful descriptions of pests on the Internet, including this one from the RHS. club root – is another soil-borne disease that can be found in patches over the site. It distorts the roots of brassica plants. If you are limited in the amount of time that you can spend on the allotment it will pay to put some thought into how you can minimise the amount of weeding that will be required. Here are some thoughts to get you started. One of our plot holders grows on raised beds. On a number of beds she has put down ground cover material which is weighted down by bricks and wood, as shown in the picture opposite. Slits are then made in the material where the rows will be, and plants are subsequently placed in the slits. The distance between the slits obviously varies depending on the crop: 12 inches apart for onions, leeks, sweetcorn, broad/French beans; 16 inches apart for the likes of potatoes, brassicas and peas. The result is that there is little weeding to do on these beds. The material is removed in the winter to allow digging, the soil left exposed for several days for the birds to peck over, and then the material is put back in place. Inexpensive material will usually last for a couple of seasons; the more expensive good quality material can last for 5 or more years. Put some of the ground down to soft fruit, e.g. a double row of raspberries, and place black ground cover material (the sort that you can buy in a garden centre that lets water through) between the rows to prevent weeds. For strawberries, some plot holders put ground cover material down on the bed, and then cut holes in it where the strawberry plants are to go. An alternative is to use wood chip. With respect to vegetables, there is no getting away from the need for weeding in the early part of the season until the plants become established. However, after this point in time some plants are better at keeping the weeds down than others. Grow plants that have large leaves, as they will minimise the amount of light that reaches the ground, resulting in a significant reduction in weeds. Examples include: courgettes, marrows, squashes, pumpkins and some brassicas. The picture shows a canopy of leaves produced by courgette and squash plants which is approximately three feet high by late July, effectively minimising weed growth in the soil beneath. Similarly, tall growing plants can provide sufficient shade to reduce the amount of weeds, e.g. double rows of runner beans or climbing French beans. Potatoes with their sheer volumes of leaves and steep sides (after they have been earthed up) tend to need less weeding while they are growing. Looking around your site you will probably see that some plot holders use the raised bed system. The growing area is divided up into beds, each typically 4 feet wide. Around the perimeter of each bed is a path that is 12-18 inches wide, sufficiently wide to walk on. These paths are usually a minimum of 4-6 inches below the level of the beds. The general idea is that you do not walk on the beds. At 4 feet wide, it is easy to reach as far as the middle of the bed when working from a side-path. The length of each bed does not matter greatly, although if they are too long there is a temptation to take the shortcut to the other side by walking over the bed, which is something that you are trying to avoid. On our site there are a range of lengths: from one plot holder who prefers short beds (8 feet long) where each is dedicated to a single crop; to mid-size (12-15 feet long); and to the full width of the plot (up to 30 feet). Some plots have wooden surrounds to their beds to prevent the soil escaping onto the surrounding paths where bark is often put down to minimise the weeds. Others do not worry too much about escaping soil; and they may use strips of old carpet (bottom side face up) on the paths to keep the weeds down. This is not as unsightly as it may sound – the small amount of soil that ends up on the carpet makes it blend in with the soil on the beds, making it almost unnoticeable plus it is periodically tipped back onto the bed once or twice a year. Note that some plot holders worry about chemical residues escaping from carpet and therefore do not us it. While it is purely psychological, management of the overall plot seems easier and more rewarding. For example, the completion of (say) weeding on one bed somehow seems to bring with it a greater sense of achievement and a feeling that progress is being made. Some vegetables prefer firm rather than loose soil, e.g. sprouts and the onion family. In this case it will pay to deliberately walk on the bed to firm the soil before planting. the fourth and by far the most difficult step is to implement your own land drains or french drains (land drains without pipes) to carry the excess water away. However, drainage work is most likely to be carried out as a site-wide activity as it can affect a number of plot holders – your neighbour is not going to be very pleased if your drain simply moves the water from you to him! If your neighbours will not be affected here is a useful short article on laying land and french drains. The ability not to simply give up if at first you do not succeed is a key prerequisite for any serious plot holder. At one end of the spectrum initial failures may just be attributable to general inexperience. Hopefully, there will be some successes to offset against your failures, and you will gradually improve on your “success rate” with time. It may be that you will struggle with the odd crop due to your soil conditions. As I have said before, talk to your neighbours to understand if there are specific soil-related problems on the site, e.g. fungal diseases such as white onion rot or club root. Over time you will discover whether there are ways and means of overcoming these problems or if you should just eventually give up on these crop(s). I feel very sorry for anybody who took on a plot for the first time in 2012. It must have been very disheartening. It was without doubt the worst growing season in living memory due to the appalling wet weather. We all struggled. Even the most successful professional growers and showmen had a poor year. Believe me when I say that, although growing seasons do vary from year to year, 2012 was exceptionally bad, and it will hopefully not be repeated for a long time. We have taken bees for granted in the past, assuming that they will be along in large numbers to pollinate our fruit and vegetables when we need them. However, the current crises among honey bees where entire hives are dying over the winter period or where bees are leaving hives and not returning should make us realise that we can no longer take them for granted. If there is a shortage of bees we need to ensure that we do all that we can to attract those that are around by appropriate planting of annuals and perennials around our plots. Here is a useful list of plants that will attract bees. For beginners here is a useful guide to basic gardening tools. While Spear & Jackson and Wilkinson Sword are reputable makers of gardening tools, Joseph Bentley seem to gather more plaudits in reviews and from gardeners. They also supply a range of tools for ladies and children. Places to find reviews of gardening tools include: Gardening Which (although you may need to be a subscriber to see everything) and Fredshed (an enthusiast of gardening and diy tools). In addition, you will find periodic discussions on tools in various gardening forums on the Web; Allotment.org has a dedicated equipment forum. The effect that the weather has had on individual crops. To give you some ideas, here are a couple of extracts from simple cultivation logs (both in PDF format). LottieLog shows one plot holder who records information by crop; The second sample (handwritten) shows another plot holder who logs information by date. Skeletons for these samples can be downloaded if you want something to get you started … information by crop spreadsheet and a blank handwritten log. While it is hoped that you will find useful information on these pages, it is essential that you purchase a good book on growing fruit, vegetables and herbs. Some of us older brethren have acquired various excellent books over the years, but many of them are unfortunately now out of print. The popularity of allotments in recent years has resulted in a plethora of books with the magic word “allotment” in the title. Unfortunately, many of them are cases of established garden writers jumping on the bandwagon. A quick browse is often sufficient to tell me whether a writer knows anything about the special trials and tribulations of growing on an allotment. One book that I have seen recently in the book shops which passes this test is The Allotment Experience: Everything You Need to Know about Allotment Gardening – Direct from the Plot by Ruth Binney. Ruth is an established garden writer but importantly she has been an allotment holder and obviously understands the unique problems associated with them. Growing Vegetables by Tony Biggs in conjunction with the RHS (published in 2006) is recommended, giving concise but comprehensive information on growing a variery of crops. By far the most popular books over the last 10-15 years, if you ignore the chemicals that are frequently mentioned, have been Dr D.G. Hessayon’s concise Expert Guides, viz. The Vegetable & Herb Expert (ISBN: 0903505460) and The Fruit Expert (ISBN: 0903505312), both published by Expert Books and available in garden centres. Buczacki, S., Best Soft Fruit, ISBN 060057733 3, Hamlyn 1994. I have attempted in this and other pages to incorporate links to useful articles wherever possible. In addition, there is a separate links page. I have already mentioned David Frary’s allotment pages; it is the best site that I have seen so far for new plot holders. While it is not yet complete, it does cover clearing the plot, digging, and first year cultivation. I would also recommend growingyourown.info. It is well-structured, covers a comprehensive range of crops, has lots of excellent pictures and is very readable. There is lots of stuff out there on the Internet although much of it, particularly the blogs, is of very variable quality. Much emphasis seems to be placed on the personal touch (or social networking to use the jargon), e.g. “here are my piccies” and “now I know that I ought to be down on the plot but I am here wittering on about myself”. While such writing may be enjoyable, and it is always reassuring to know that there are other people out there who are in the same boat as you, it is not always particularly helpful. Allotment forums can provide a useful means of increasing your knowledge of growing fruit and vegetables simply by browsing the questions that are asked along with the answers and observations that are returned. Currently, the most popular forum by some distance is Allotments4All. Allotment.org.uk is another popular forum. One word of warning – expect the odd firestorm on any forum. There are always people with short tempers who have difficulty in counting to ten before they mouth off, usually when they think that they have been offended. Raspberries. By far the most frequently asked question from newcomers seems to be “how do I prune raspberries?” The answer is that it depends whether they are summer or autumn raspberries. Summer raspberries typically fruit in June. The canes have a two year cycle. They grow from the ground up in year 1 and they fruit in year 2. When they have finished fruiting these canes are then cut out at ground level. Autumn raspberries tend to fruit from August through to early October. They have a simple one year cycle. All the canes are cut down to ground level in late winter. New canes will grow and fruit in a single season. If you do not know which type you have then just wait and see before doing any pruning. After raspberries come questions on compost making. This topic is covered here on the Approaches to Cultivation page. Sources of manure is another frequent question. Many plot holders on our site get their manure from the farm which is just next door. However, wherever you get your manure it is important to ensure that it is not contaminated with aminopyralid, a herbicide found in some manure which led to stunted and distorted growth in many crops across the country back in 2008. There are some growers in various parts of the country who reckon that they are still suffering. Here is a link which will give you a comprehensive background on the subject. We have been quite fortunate at Sunningdale. To my knowledge only one plot holder has received contaminated manure. 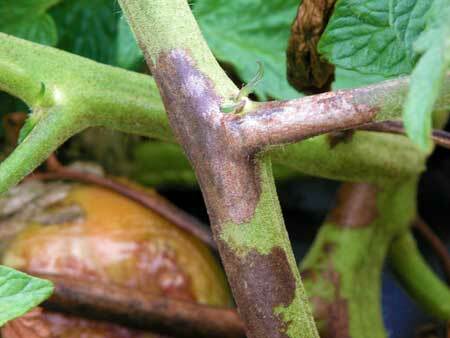 Potato Blight is usually more of problem on tomatoes which is in the same family as potatoes. It varies from season to season. In 2015 it was not a problem, not appearing until the end of September when crops had already been harvested. It appeared at the beginning of July in 2016, which is very early. The ideal conditions for blight are high humidity, plentiful rainfall and a dayround temperature of 10C or more. 48 hours with a minimum humidity of 90% and a minimum temperature of 10C is termed a “Smith’s Period”. The appearance of blight is more likely after a Smith’s period. Blight spores are carried on the wind. The leaves are attacked first. The picture (below left) shows a diseased leaf. They are usually the size of a 10p piece. It is important that affected tomato leaves are removed immediately, taking them back to the main stem. If the blight spreads to the stem 9see picture below right) then there is little that you can do. It will eventually move to the fruit and ruin them. You can spray if you wish. Dithane and copper sulphate-based preparations like Bordeaux Mixture can be used. However, it is important to note that they only provide a protective layer on the leaves, i.e. they constitute a preemptive measure, they will not kill blight if you already have it. There are periodic claims that certain (new) varieties of tomato are resistant to blight. The latest is Crimson Crush from Suttons. General feedback, including my own, seems to be that some leaves can still show blight symptoms. If they are removed quickly then the plant appears to fight off the disease. Plants produce lots of foliage and large fruit which, I am afraid to say, would not win any prizes for flavour. If potatoes become infected, cut the foliage down to ground level to prevent the blight from destroying the tubers. You will almost certainly have a reduced crop, but better a reduced crop than no crop at all. Under no circumstances should diseased material be composted or left lying around. Burn or otherwise dispose of it. 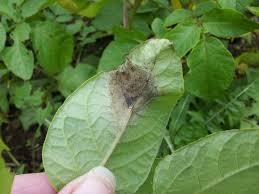 Here is a useful article on blight from the Royal Horticultural Society. Honey Fungus is usually thought of as a disease of decorative trees and shrubs. However, two plot holders, including myself, have lost their strawberry plants by using the free wood chip on the site to stop the fruit from lying on the soil and rotting. In our cases the wood chip obviously included a tree or shrub that contained honey fungus. It is recommended that our free (untreated) wood chip should not be used on a strawberry bed, or indeed any other bed. Plant any replacement strawberry plants as far away as possible from the infected site. Mildew on Cucurbita. Courgettes and marrows are mainly affected, although other members of the Cucurbita family may also suffer. Damp weather and poor air circulation (often because plants are too close together) are frequently the cause. The mildew can usually appear from early August onwards. The remedy is to remove diseased leaves as soon as possible. On one occasion I practically denuded an entire plant. It took about three weeks to recover and produce more courgettes. Storing Winter Squashes. It is recommended that you leave a couple of inches of stalk attached when you remove the squash from the parent plant. Wipe each squash with a cloth which has been soaked in a weak bleach solution, paying particular attention to the point where the stalk is attached to the squash and to the underside where the flower was originally, as these are the places where rot is most likely to set in. Ideally, place the squashes on a sunny window ledge, conservatory or greenhouse for two weeks, turning them 180 degrees every other day. This process will help to harden the skin and hopefully lengthen their keeping qualities. Store the squashes in a cool place, e.g. a shed or garage. Beware that they do not like sub-zero temperatures, and so you may need to bring them into the house during any particularly cold spells when the temperature is around zero or lower during the day. Butternut squashes can keep until January, possibly February. Other types of winter squash can keep longer. I have eaten some in May. Cultivating asparagus requires patience in the early years. It can be grown from seed, but I am only aware of one plot holder who has chosen that route. The majority purchase one year old crowns in early spring. Thorough soil preparation is recommended, i.e. incorporating lots of manure or other organic material before planting the crowns. See this RHS article for general advice. Do not pick any asparagus in the first year. The plants need time to build up their strength. Cut the foliage down to ground level in late autumn when the plants have died down, Pick a modest amount of asparagus the next year for (say) three weeks. From the following year onwards you can gorge yourself on the crop for six weeks each spring. But no longer .. remember that the plants will still need time to recover for the next season. A mulch every winter or every other winter will be appreciated by the plants. If you look after your asparagus, the bed will last for twenty years. Use of weed killers. The majority of weed killer sprays are applied to the leaf of the plant. The chemical(s) then travel down to the roots to kill them, and hence the entire weed. Such sprays will only work while the plant is actively growing, typically from late spring through to early autumn. Such sprays should only be applied to overgrown areas which will not be cultivated until the following season. Blackfly can be a problem on beans (broad, french and runners). Autumn sown broad beans are likely to suffer less than spring sown broad beans. The usual recommendation is to pinch the tops out of broad bean plants as soon as any blackfly is spotted. Ants are often the villains on french and runner beans. They farm the blackfly – wanting their honey-like secretions. The first step is to deter the ants. One approach is to apply a little ant powder to the base of any bean plant that ants are seen on. Blackfly can be rubbed out (between finger and thumb) early in the season (June) before there are too many of them. Companion planting is another technique. Some plot holders plant marigolds around the beans. The smell can deter the blackfly. If all else fails, you can use an insecticide. Pay close attention to the instructions on the tin, e.g. how many days between spraying and picking beans. Ideally, try to use any insecticide well before any beans are ready to be picked and just live with any residual blackfly that may subsequently appear. Pheasants and beans. Over the last three years or so, pheasants have taken to pulling up the seedlings of broad beans, runner beans and french beans. They are actually after the seed. Once the plants are 5 or 6 inches high they will leave them alone. So, either provide some physical protection initially or only put established plants out rather than sow seed directly in the ground. Flowering Rhubarb has been a feature this spring (2017). The very dry conditions have obviously stressed the plants, encouraging them to reproduce. This is more likely to occur on young plants. It is important that the flowers are removed as soon as possible, otherwise the plants will simply throw their energy into reproducing rather than producing stalks. Frost damage. A number of new plot holders have asked about the timing of sowing / planting, having experienced frost damage, most notably on early potatoes. Frosts can occur anytime up to the end of May. Having said that, there was one year when we had a frost in early June! Potatoes will recover from frost damage but they may lose some of their overall productivity. They should ideally be covered with earth when the foliage appears. This will protect the plant from getting frost damage. Continue this process as the plant grows until you reach the point where earthing up is no longer possible. If frost is still forecast then you can cover with fleece to provide a degree of protection. Any other tender plants will equally be at risk until the end of May. They include: runner beans, french beans, tomatoes, peppers, courgettes / marrows, squashes and cucumbers. Unlike potatoes, they are extremely unlikely to recover. Coping mechanisms include protection using cloches, cold frames and fleece. Note, however, that they may be insufficient to keep severe frosts at bay. Another approach is to use successional sowing so that if you lose the first batch then you still have the second sowing to fall back on. For example, you may sow some runner beans in late April, followed by a second sowing at the end of May, and even a third at the end of June. Obviously, this approach is only possible if there is sufficient time left in the summer for the crop to grow. This would not be possible with aubergines for example. 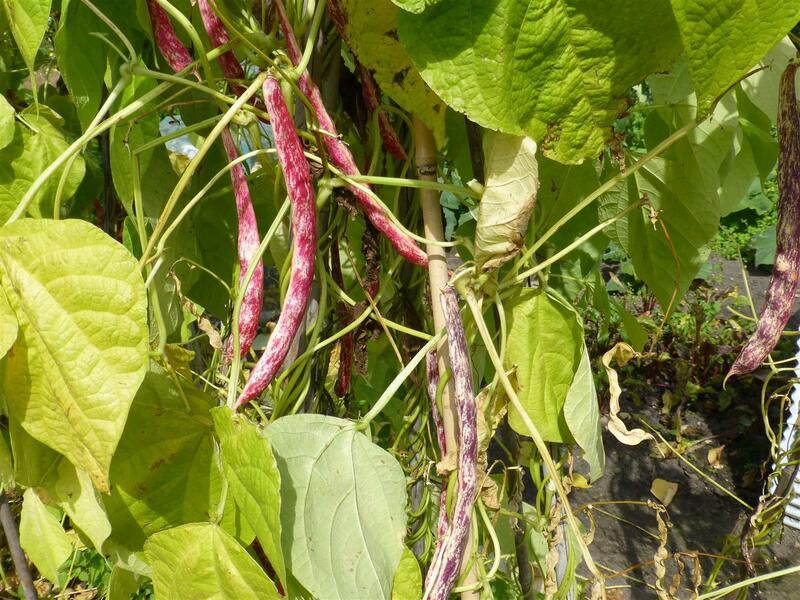 Borlotti Beans are a useful crop to grow. There are both dwarf and climbing varieties. I think that the climbers ultimately offer better value for money. The picture below shows a range of pods. Pods are ready to pick when they turn a dark purple in colour (the ones in the centre and on the right in the picture) and they feel papery, i.e. they have lost most of their moisture. Beware that if you leave them on the plant for too long after they have reached this stage then the pods will burst open and scatter the seeds, the plant considering that it has done its work and now is the time to reproduce itself. Ensure that you dry the beans fully before you put them in jars for winter use. An alternative is to freeze them. You can find various methods of freezing them described on the Internet. Page last updated on December 9th, 2017.